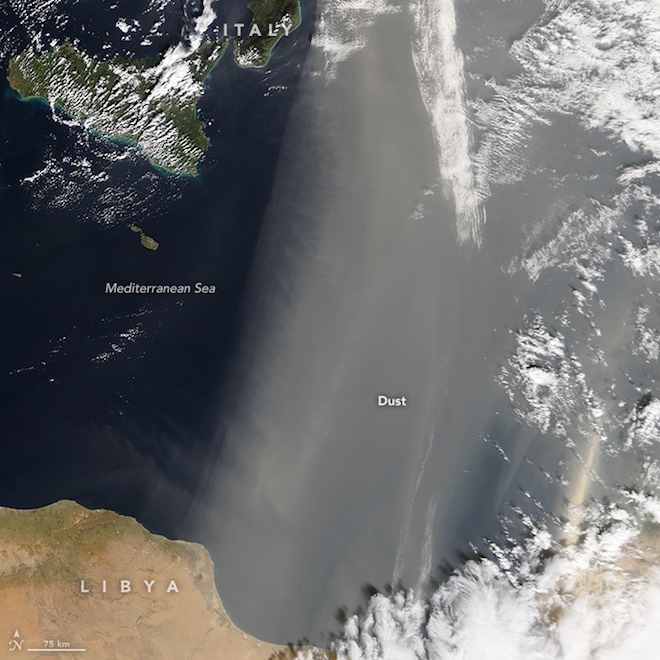 On Wednesday, February 7, the MODIS spectroradiometer on NASA’s Terra satellite captured dust from the Sahara, flying over the Mediterranean Sea to southern Europe. According to reports, the dust was carried over the air by a wind of sirocco (Italian scirocco – east wind). In North Africa, the same desert wind is known as “chrome” (hot) or “arifi” (thirsty). A warm, dry air mass originates over the Sahara, then takes the moisture over the Mediterranean Sea and moves north to areas of lower pressure along the shores of Europe. The picture shows how the dust is directed to Italy and further north. According to local media reports, the wind brought to Italy a temperature rise above average values, and the sand increased the likelihood of rain. Fine grains of sand, when interacting with water droplets, can contribute to the formation of fog or precipitation. In the coastal areas of the country, the machines were covered with a layer of dust.